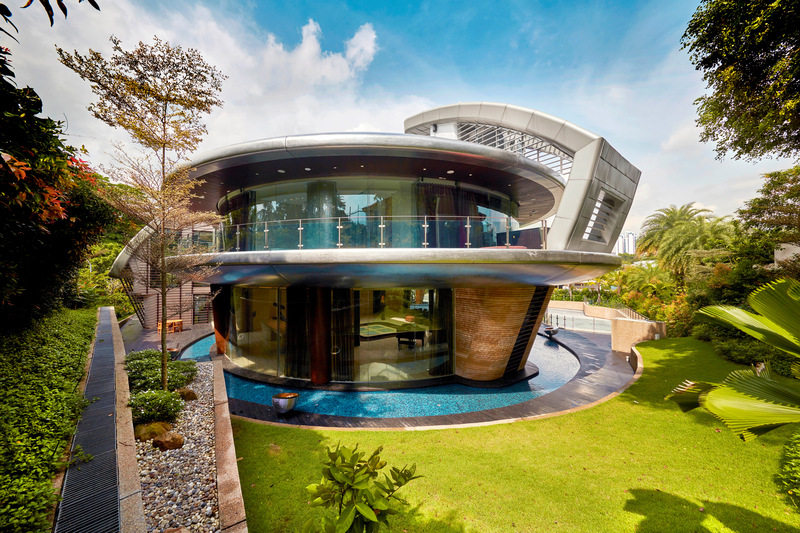 This extraordinary house in the Jervois Hill area of Singapore was designed at the same time as the two Alba Villas on Sentosa and for the same client. 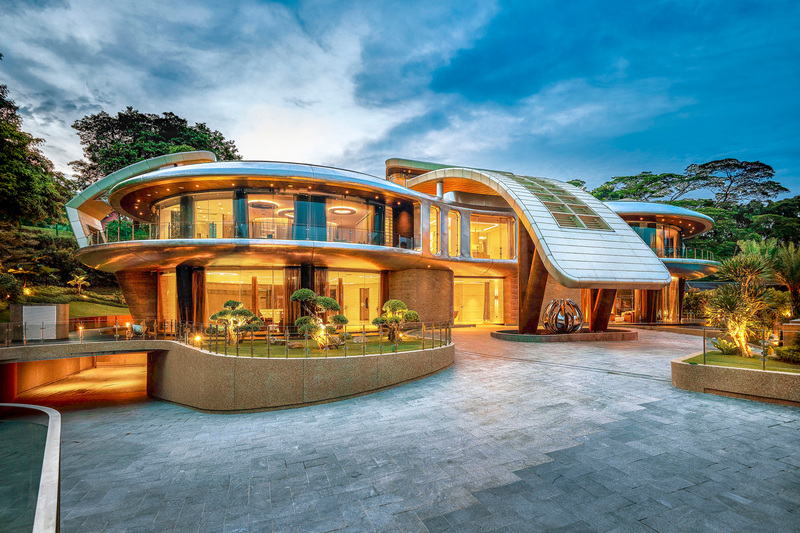 It was not called Otto (Italian for ‘eight’) at first, and the final version is very different from the original conception which was driven by the client’s enthusiasm for feng shui. Accordingly, it first had the form of a number eleven, slightly offset. But Massimo had a different idea “halfway through” and suggested another feng shui-driven formal proposition ─ a lucky number eight. Hence, the curvaceous interlocking of two circular pavilions, each with an internal ‘courtyard’ or atrium in the middle to emphasise the eight-form and draw light down into the building. Having arrived at a dynamic plan for the building, the architects then conceived an equally dynamic elevation, resulting in a building which, like the later Lambda (designed later, but finished before Otto), looks like a ‘flying saucer’. Due to the transparency of the first and second storeys and the outward thrusting walls and canopies, the house gives the impression of a spacecraft either about to land or to take off. If one could look down on the house, this image would be amplified by the way the pool surges around the perimeter of the house (morphing into a water feature), by the radial canopy to the outdoor barbeque area, and by the way the paths and landscaping undulate around the building, perhaps like the outward thrust of air forced down from the hovering spacecraft. The ‘spacecraft’ image is supported by the cladding. Influenced by the sculptural work MDL was doing, using apparently seamless stainless steel, the idea was to give the house the same quality and have it appear as “one unique piece of steel floating on water”. In other words, this is a massive piece of sculpture whose stainless steel cladding lends the house a spectacular and unique character. 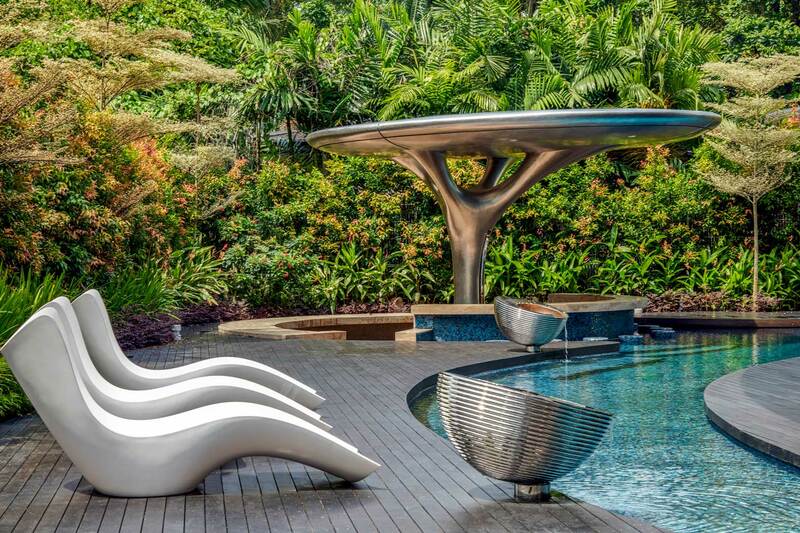 The house becomes an art work in its own right and, whether seen from the ground or above, demands the attention of any onlooker and provides the satisfaction we expect from a work of art, a massive piece of sculpture. The original intention was to use titanium, but it was not feasible to weld titanium and achieve the ‘seamless’ effect. Instead, stainless steel has been used with only an expansion groove every 8 metres to allow for heat expansion. This is very much a house for entertaining and the private domain ─ a master and two junior bedrooms, two guest bedrooms, a prayer room, study and game room ─ is clearly separated and contained on the second storey. Entry to the house is either through the basement or through the ground floor main door. These offer two very different arrival experiences. The basement contains a huge underground carpark. From here the visitor enters the basement lounge, down a broad travertined corridor, welcomed by Massimo's sculpture, ‘Tai Chi’, a sphere intersected by two holes ─ a three-dimensional representation of yin and yang, of tai chi. The basement has a cruciform plan with a lounge at the point where the two axes intersect. The entry axis looks down past this lounge to a karaoke room. On the left, the intersecting axis leads to the laundry and a particularly luxurious sauna, spa and shower room. On the right, it leads to a bar, wine cellar and home theatre. The arrival experience upstairs is quite different from this darkly opulent world. Visitors arrive under a porte cochère formed by an arched canopy extending down to the ground. 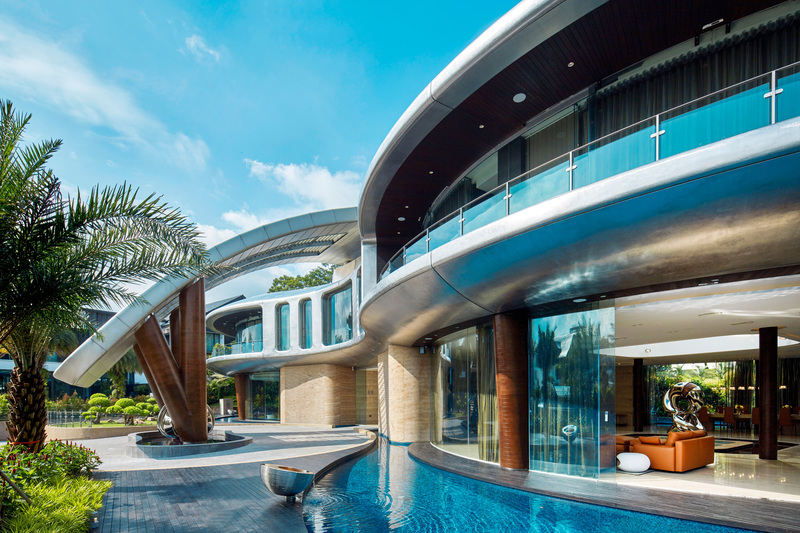 The curving driveway and canopy, the meandering paths and water feature, the swooping forms of the house itself immediately communicate the feeling that this will be a fully integrated and continuous experience. The visitor crosses the moat over a footbridge and enters another portal space, signalled as downstairs, by another circular sculpture, ‘Vase Otto’, which intensifies its impact by an optical illusion. It is actually a two-metre, semi-spherical bowl with a lamp hanging above it. But the light streaming down from the lamp creates the illusion of a single piece of sculpture. It is an example of those pieces which Massimo describes as having an “artistic function” rather than being sculpture as such. On this ground floor level, the organisation is again axial. Turn left and the visitor enters a large dining room ─ more like a restaurant ─ for accommodating large numbers. 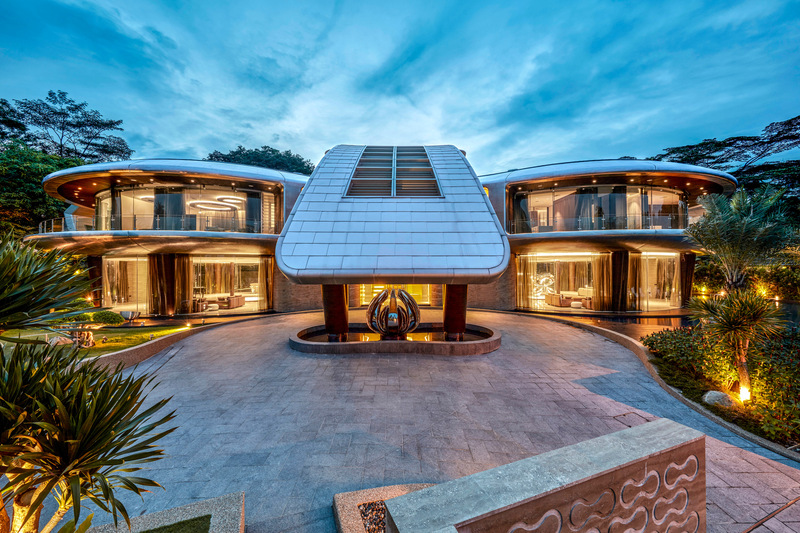 To the right is another, slightly more intimate and less formal, dining space with living room and lounge leading out to the pool and barbeque area with its radial canopy. Both these atrium spaces are floored with glass tiles which draw light down into the basement. The smaller space has another large sculpture as its centrepiece, ‘Infinity’, which sits in the atrium or courtyard space. It consists of two intertwined infinity symbols, but began life as a four-leaf clover. Hence, it combines two auspicious elements and represents “a limitless fortune”. The spaces in ‘Otto’ are big. The bedrooms, for example, are massive ─ the master bedroom occupies half a floorplate, about 500 square metres. “You have,” says Massimo, “these round things that embrace you and then you have the spaces inside.” Despite the voluptuous external form, the internal spaces are largely straight, the bedrooms having just one big curving wall. Nonetheless, there is an opulence to these rooms which seems to celebrate the privacy of personal space as a kind of luxury. ‘Otto’ is the best example so far of MDL’s integrative philosophy where everything ─ from the landscaping through the external form to the interior architecture, fixtures, finishes and furnishings ─ forms an integrated whole, a single experience, to communicate one central, driving idea for the house.